At Inspire Seattle, we are proud to offer a fun, empowering workout that strengthens your body, improves your confidence, and challenges you every time you come to our fitness studio. You can rely on our workout to consistently bring you closer to your fitness goals, regardless of when you decide to jump on the Megaformer. However, to truly get the most out of your workout, it’s important to be thoughtful about how you’re fueling it. Just like a car, you aren’t going to get too far without some gas in the tank. We need food for our bodies to function optimally, so more important than anything, make sure that you are eating at least a quick snack before you come into our studio. That being said, there are some food choices that will make your workout go smoothly, and others that will leave you uncomfortable. 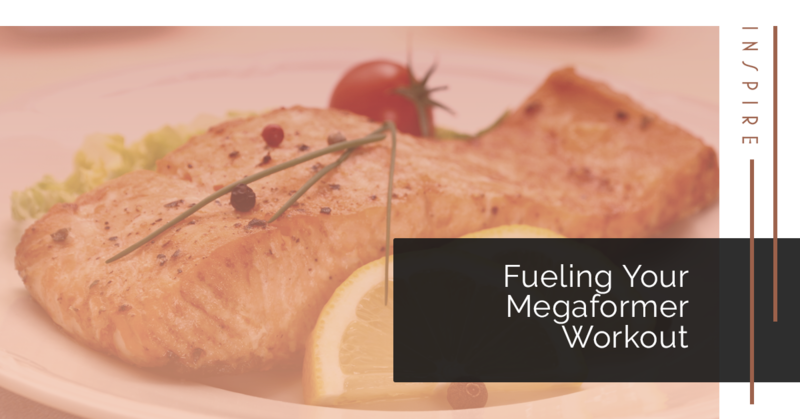 In this post, we will go over some good options for fueling your Megaformer workout. First off, if you will be eating a full meal before you come in for your Lagree fitness class in Seattle, it’s best to eat between an hour and two hours before. This gives you plenty of time to digest while still providing you plenty of power for your workout. What you eat specifically can vary, but you want to make it a balanced meal with protein, fat, and carbohydrates. Protein and fat both burn slowly, providing much-needed energy to help you maintain stamina. They also require your body to work a little harder to digest, so don’t wolf them down 15 minutes before your class. In addition, while carbohydrates provide great, quick-burning energy, most people find that too many before a Lagree fitness class isn’t necessary because you aren’t putting in as much aerobic work. That being said, you are the expert on your own body. Eat what you digest well and gives you the energy you need to power through an intense workout. Alternatively, you might opt for a small snack half an hour to 45 minutes before your class. This is a good idea if you are doing an early morning class and won’t have time to let a full meal digest, or you haven’t eaten in a few hours and you need a boost of energy. If this is the case, you will want to focus more on getting carbohydrates that you can quickly digest so you can put that fuel to good use immediately, as well as a small amount of protein to aid your muscles. In addition to making sure you’re getting enough food, you want to make sure you are staying hydrated. Drink water before, during, and after your workout. If you struggle to drink just water, consider slicing up some fruit and putting it into your water bottle for a lightly flavored beverage. We hope that these tips help you get the most out of your Megaformer workout. If you’re interested in trying a Lagree fitness class in Seattle, Inspire Seattle is the only studio that offers this innovative type of workout! Schedule your first class today and get two classes for $30!